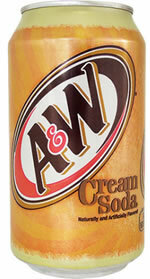 A&W Cream Soda is a flavor variation from A&W Soda. A&W Cream Soda used to contain 29 mg of caffeine /12 fl oz can but this has since been changed to a caffeine-free product. Cream sodas can be hit and miss when it comes to caffeine. Some brands include it while others do not, always check the ingredient label to be sure. The company that makes this cream soda is most famous for their Root Beer, which originated in California in 1919 as a partnership between Roy Allen & Frank Wright. 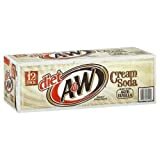 Since becoming available in both cans and bottles, A&W Root Beer was followed by Sugar-Free Root Beer (now named Diet A&W), then Cream Soda and Diet Cream Soda. These products are among the top sellers of their type, described as a smooth, rich, thick and creamy drink. A&W is now owned by Dr Pepper/Seven Up, Inc. a division of London-based Cadbury Schweppes plc. Carbonated water, high fructose corn syrup and/or sugar, sodium benzoate (preservative), natural and artificial flavors, caramel color, citric acid, flavored with vanilla extract. 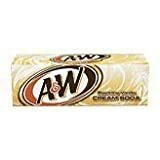 How Does A&W Cream Soda Compare? A&W Cream Soda contains 0.00 mgs of caffeine per fluid ounce (0.00mg/100 ml).